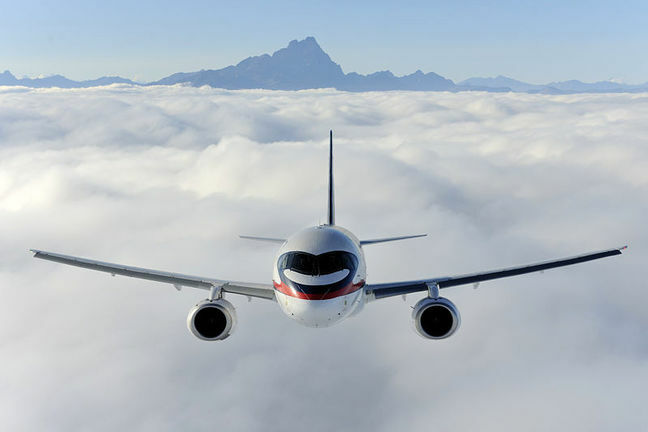 EghtesadOnline: The Russian company Sukhoi Civil Aircraft will get back to the issue of selling Sukhoi Superjet 100 (SSJ100) jets to Iran after reducing the share of US components in the plane to under 10%, the firm’s president, Alexander Rubtsov, said on Thursday. The two countries signed memorandums of understanding in April on the sale of 40 SSJ-100s by 2022 but the US decision to reimpose sanctions on Iran made it hard for Russia to obtain US-made components for the jets, Sputniknews.com reported. "We have firmly decided to deny supplies of jets to Iran under the current circumstances when 22% of the [jet’s] equipment are produced in the United States … When we reach the level of less than 10%, we will return to this issue," Rubtsov said at a press conference during the BIAS-2018 airshow in Bahrain. The SSJ100 is a twin-engine plane made by Russia's Sukhoi Civil Aircraft Company. It can carry up to 98 passengers and fly at a distance of up to 2,470 miles. The jet made its maiden flight in May 2008, Financial Tribune reported. “We will review any offer made by anyone who is capable of meeting our demand for new airplanes … We have held talks with Russia’s Sukhoi and other non-European planemakers,” Ministry of Roads and Urban Development's news service quoted Farzaneh Sharafbafi as saying. The flag carrier hoped to make progress in its fleet renewal plans following the lifting of sanctions against Iran in early 2016. Iran Air signed contracts shortly after the landmark nuclear deal for 80 Boeing jets, 100 Airbus jets and 20+20 ATR turboprops. An Airbus A321, two Airbus A330s and 13 ATR 72-600 turboprops, five of which were delivered hours before the first reimposition of the first batch of sanctions in August have been delivered to Iran as part of the contracts. The rest of the orders have been cancelled as OFAC revoked previous licenses allowing the sales of brand-new airplanes to Iran. This is while selling airplanes to Iran was among the issues directly addressed in the nuclear agreement. The Russian planemaker has been pitching its products to Iranian airlines since sanctions were lifted against Tehran. Iranian carriers had previously held talks with other planemakers, namely Japan’s Mitsubishi, Brazil’s Embraer and Canada’s Bombardier. The Japanese planemaker halted negotiations with Iran soon after the beginning of US President Donald Trump’s presidency, Iran Aseman Airlines told Financial Tribune. No progress has been made in Iranian carriers’ negotiations with the other two planemakers since Trump took office.